Another Year should, nevertheless, be on your must-see list for this year. It is an essential slow film to watch and is already my slow film of the year. Shengze Zhu draws a portrait of a Chinese migrant family. This is more than just about eating, although, if you are no more than a passive viewer, you could easily think that. I remember the time when I was younger. When my siblings were still home, dinner was always the time when we were together and talked about our day. It wasn’t dinner. It was a social gathering. Yes, we came together over food, but I found that it was more about exchanging our thoughts and feelings than about the actual process of eating. Those memories resurfaced when I saw Shengze’s film. The film has a very simple, but effective structure. It is divided into 13 months. Every meal in a certain month is shown in one long-take. In some cases, Zhengfan Yang, the cinematographer – also known for this films Distant and Where Are You Going? – uses medium long to long shots, partly framed by the inside of a house. A thoroughly engaging approach, because it plays with absence and presence. In a way, Another Year is an extension of Liu Jiayin’s Oxhide II, which is all about making dumplings. In Another Year, you don’t see the cooking. It’s all about eating, and, funnily enough, they do eat a lot of dumplings! The kitchen is something that only exists in the off. It exists in the film’s sound, but the director doesn’t go beyond that. What she does make clear – both through off- and on-screen presence – is the absolutely invasive presence of the television, which is running almost all the time. It adds to the already claustrophobic nature of the room where most of the film is set. Why did I remember my childhood when I saw the film? Another Year tells the story of a family, which unfolds during dinner time. In January, the father comes home and the mother complains that she cannot stand her mother-in-law. In February, the mother-in-law has a stroke and is only talked about because she’s in hospital. In March, the mother has moved with her two smallest children to the house of her mother-in-law to look after her. And so it goes on. Every month, every meal, tells a new part of the story, which you have to piece together on the basis of the dialogues you hear. You cannot just sit and stare at the screen. Shengze Zhu asks you to be active. And if you are, then you notice the currents below the surface. Another Year is drawing a picture of a family under pressure. The film is not a picture of happiness. If anything, the film is a portrait of frictions, of arguments, of anger and of impatience. No one in the film seems to be really happy. 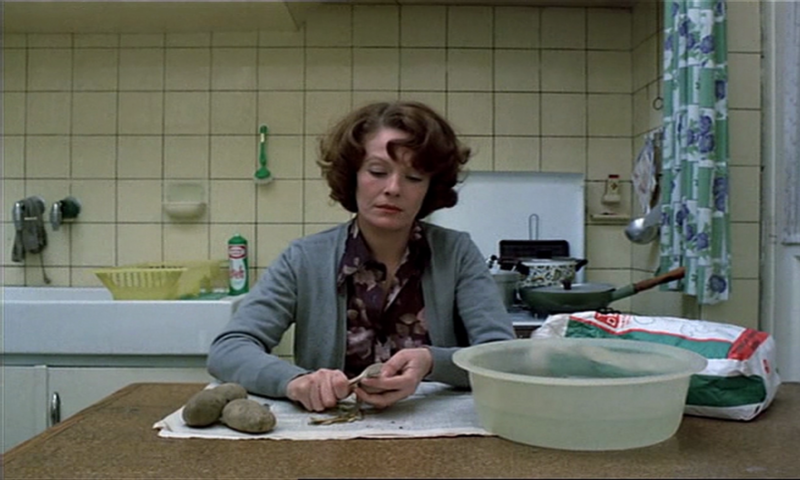 It often appears as though life is a chore, and yes, the mother does utter this early on in the film: “My God, why is life so hard?” Money is scarce. She has three kids with her husband being at work all day. Towards the end, she actually complains about this, but it is not even clear what she wants because she feels offended when her husband offers to stay home to look after the kids while she goes out to earn money. So what do these characters want? The oldest daughter wants new shoes. Then she wants new socks. And new chopsticks are also necessary. There is an almost constant “I want this – I want that” in the film, but because of the family’s poverty, the characters are stuck and do not seem to be able to move forward. This is shown quite literally by the framing, which is predominantly claustrophobic. The camera is often positioned in a small room where the characters eat, sleep, watch TV and play. It seems as though their entire life plays out in the very room we see in front of us. It’s not a surprise that frictions and arguments are almost a daily routine. There is no breathing space. Nor is there any light. I found that the entire film was pretty dark. Natural light was scarce. I’m aware that the family eats in the evening and that in some months there is no more natural light at that time. Yet, I do believe that the lack of natural light is indicative for the family’s misery. The claustrophobic space and the lack of light are enough to get a sense of unhappiness, of frustration, also indicated by a lot of shouting and accusations between the characters. The dialogues are – at least for this point – not necessary. Their mood, their thoughts, they are all visualised by the film’s aesthetics. Another Year sounds like a pretty simple film, and yes, it is based on a very simple concept. In the end, we see thirteen family meals, although we don’t really see that, because the family never sits quietly together, and eats. They’re often all over the place, especially the young children. But this simplicity, which I have seen so often in other slow films is giving us a complex picture of an unhappy, poor family, and a society that is still haunted by the one-child policy. It gives us an insight into their lives, into their concerns – simply, by being. Shengze records this being, and captures a fascinating view on a modern working-class family in China. A three-hour long must-watch!